The Afghan Electoral Complaints Commission (ECC) has for the first time invalidated some ballots from the presidential election because of fraud. There was "clear and convincing evidence of fraud" in Paktika, Kandahar and Ghazni, areas that largely backed President Hamid Karzai, it said. Earlier this week results from 600 stations where there were suspected irregularities were "quarantined". Correspondents say that there could now be months of arguments about the vote. Afghanistan's second direct presidential election on 20 August was marred by low turnout and widespread allegations of vote-rigging, intimidation and other fraud. According to partial results, Mr Karzai has passed the 50% mark, which means he does not have to face a second round run-off. However, the complaints commission does have the authority to order a recount or even to remove a candidate from the election. If it throws out enough votes "cast" for Mr Karzai it could also effectively order a presidential run-off by reducing his share of the vote to under 50%. Announcing the commission's decision, a statement on the ECC website said that all ballots in five polling stations in Paktika were invalidated. In Ghazni the ECC ordered that ballots cast in 27 stations be invalidated, while in Kandahar ballots in 51 polling station were invalidated. 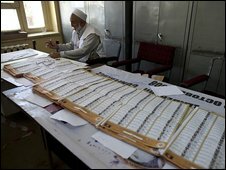 Afghanistan's 25,450 polling stations had 600-700 ballot papers each. The ECC said in a statement that its investigations in Ghazni found "a number of indicators of fraud". Those included unfolded ballots, votes for candidates inserted inside bundles for other candidates, miscounted ballots, missing material, uniformity of markings, seal numbers which did not match numbers on the record of seals and lists of voters with numerous fictitious card numbers, the statement said. In Kandahar and Paktika the ECC said that "ballots were not legally cast, or were not legally counted". The BBC's Chris Morris, in Kabul, says that although this is the first time any votes have been thrown out altogether there will be more to come. A source at the ECC said this was just the start of a process, our correspondent says. The organisation has received many complaints and has a large number of suspicious voting patterns to work through. The whole process could take weeks or even months, some have suggested. Fifteen of the polling stations invalidated by the ECC are in one Kandahar district from which the BBC reported widespread fraud allegations in the aftermath of the election, our correspondent reports. The ECC's move follows complaints earlier on Thursday by Abdullah Abdullah, the main challenger in the election, who said that the count was being manipulated by President Karzai. Speaking exclusively to the BBC, Mr Abdullah said the election commission was on the president's side. A spokesman for Mr Karzai, Wahid Umar, told the BBC that any "interference" in the work of the election results would not help the final process.